A frequent request I come across is the ability to let users filter, or sort, posts on the front-end of their website. Perhaps users want to view posts alphabetically, or maybe see only those posts with thumbnails? This already makes sense for regular posts but can be even more meaningful in the case of products, photos or other content types. In today’s Weekend WordPress Project I’ll give you a quick rundown of how you can implement a feature like this in the Twenty Fifteen theme. Let’s get cracking! As always, you need a child theme. We have a guide to child themes right here on WPMU DEV, I recommend giving that a read if you are not familiar with child themes. Let’s add three controls: one for ordering the posts, one for setting the direction of sorting and one for showing only posts with thumbnails. The first step is to copy the parent theme’s index.php into our child theme. The solution is pretty simple: I cheat. I use the developer tools in Chrome to inspect the regular article elements. In this case, it let me see how the elements get their box shadow and their margins and I simply applied these rules to my own element. 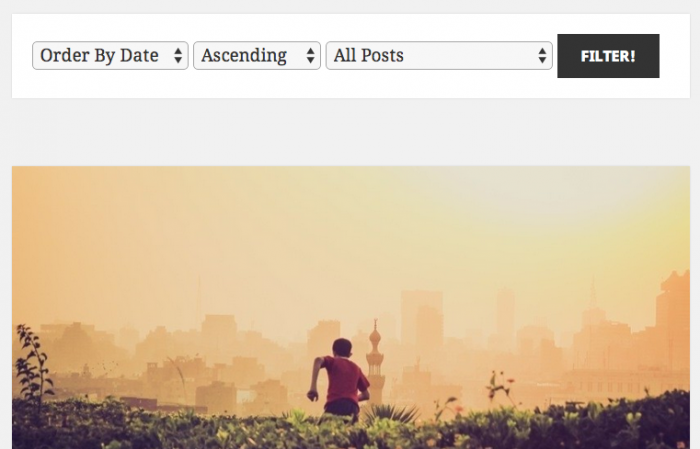 Let’s select “order by title,” “ascending” and “posts with thumbnails” and submit the form. You should actually see a change without doing anything to the code. The tidbits of information can be recalled in our PHP scripts using the $_GET variable. WordPress already knows what the order and orderby parameters mean and it uses them in the default query. As a result, if we only need ordering and order direction we’re actually all done. That’s all great, but again, how did I know this? I could have used “order_by” as a parameter instead of “orderby.” In this case WordPress does not pick up on our intentions. I had a look at the WP_Query documentation in the WordPress Codex where there are a bunch of parameters, many of which can be used in URLs. Now, let’s implement our post thumbnail parameter. A post has a thumbnail if it has metadata with the key _thumbnail_id associated with it. We’ll need to modify our query to make sure this is taken into account. Let’s do this now with query_posts(). We merge the parameters of the original query with our own new parameter, which results in a different set of posts. Our form now works but it doesn’t remember our selections. Let’s fix that by rewriting our form and using some PHP. All done. The form should now remember our selections based on the $_GET variables in the URL. If you have pretty permalinks turned on (which you should), the page has been redirected to a new URL, most probably http://yourwebsite.com/category/wordpress. Our filters will not be visible because the archive.php file handles this view, not index.php. In addition, our category name is not passed as a URL parameter so we will need to use some additional trickery to make our filters work. The alternative would be to use a function instead of outputting our form in index.php as is. You would need to detect the category from the WordPress query itself and display the current selection based on that. Adding your own filters is not all that difficult but requires a bit of fiddling. In our case you may want to make sure the pagination is removed when the order is set to random. It could be replaced by a “show more randomness” button, which simply reloads the page. Hopefully this article has given you the basics of how you can accomplish this for yourself and you will be able to build the filters you need. 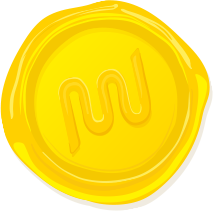 If you have any questions about this project, feel free to ask in the comments. I didn’t know it was so simple ! I’m trying to extend this as a multi-filter (by custom_field and title), as wp 4.1 allows that (multiples orderby, by array). The meta_key part is working like a charm, but I’m a little bit lost about how did you pass your orderby and order arguments to the modified query. Could you clarify this? Nevermind… I just had to make another merge of arrays to make it work. Thanks for this great post. It really helped me a lot. I’m trying to apply this same method to WP_User_Query, so I can filter by the custom field Gender, so either the value Male or Female, has anyone got any pointers for how I could adapt the above I’m struggling to figure it out. Thanks for the response, that’s similar to my main query, which is below, I think my main trouble is getting the inputs from the form to the query if that makes sense. So the below code, is the base of what should be displayed before any filters are applied, then if someone just wants to view Male users the main query below is used plus the meta_key gender with the value Male would be applied if that makes sense, I can’t quite get my head around that bit. You’re a star, thanks for your help with this one. I’m confused as to which it is but it’s only 2 possiblities so I can hack away until the answer is right. So the best I’ve been able to come up with after a few hours of trying to figure out how to do this is the following non-working and silly looking code. What would I have to do to pass a meta_key value in to the orderby call? Or would I have to take an entirely different route? Please keep in mind I am very new and won’t understand a theoretical answer and would appreciate a working copy/paste type example. Thank you for your time. I think you are misunderstanding the syntax a bit. I’ll just paste something I think that will work, I think it will be easy to understand :) Here’s an example of a completely ordinary query, but ordered by a custom field. 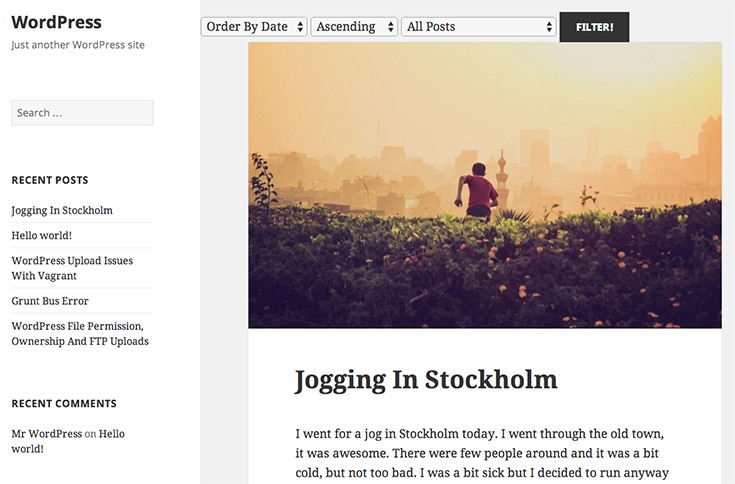 The idea is that the orderby parameter tells wordpress how to order posts. This could be “title” or “date”, or a few other things. If you need to order by a meta field it should be “meta_value” or “meta_value_num”. Use the former if your values are simple text, use the latter if they are numbers. Then, also specify the “meta_key”, this is the meta key based on which the ordering is done. I think you may be underestimating the difficulty of this problem, because there is no built in way WordPress tracks popularity, this is something you must use a plugin for, or you have to build for yourself. In other words, this will only work for you if you already have a meta field which contains the relative popularity of an article, or some other metric like views which would allow you to order by. I’ll try to explain as best I can. I’m trying to do what is in this post. I want to have a front end where visitors can choose to sort by title, date and views. The tricky part seems to be the views since that requires a meta key. I want to retain the ability to sort by date and title but just add the ability to sort by views as well. Sorting by views would be one more of the drop down options listed in among title and date that the visitor would see. They could then choose any one of those options. Thank you! I’ll be playing this weekend and let you know how it turns out. It seems like a function lots of other people would want to add to their site. Hi! I realize this is an older post, but I’m trying desperately to modify this to fit my purposes, and I’m having a heck of a time. All I want to do is to add the functionality to sort posts by the numeric value of a custom field called “likes”. I feel like it should be easy, but I cannot for the life of me figure it out. :P I saw the previous comment thread that was sort of similar, but I couldn’t figure out how to apply what I read there. Any suggestions?